Not first time ordering contact lenses...and i dont regret! I am your customer forever! As a contact wearer trying to get prescription lenses for a halloween outfit quick these were great and arrived on time. Excellent for halloween, will be using again! Perfect for Halloween. I was really impressed with a quality. These lenses are fantastic, really comfortable and having your own prescription is great. Would recommend to anyone who wants to make a statement! I bought the Devil Red prescription contact lenses as part of my costume for a Halloween party. Very comfortable! Great product! Loads of different designs with lots of fun when wearing them. Work really well. Could wear for a good 10 hours without pain. Looked amazing and could see clearly. I bought the lenses for a photoshoot and they looked really good. The fact they last for a year is also great as it means I can use them several more times. The only prescription Halloween lenses I could find. Scared a lot of people with these! They were so comfy, and arrived really quick! Wore for 6 hours with no problem.Although there was an obstruction to side vision in both eyes for me on insertion, but I soon got used to it, and it wasn't much of a bother. Fab used mine for a Halloween custume! Used the zombie lenses for Halloween with 6.00 strength!I would recommend them to anyone that wants good quality lenses that are affordable! Appear a lot redder than in the photos which is a good thing. 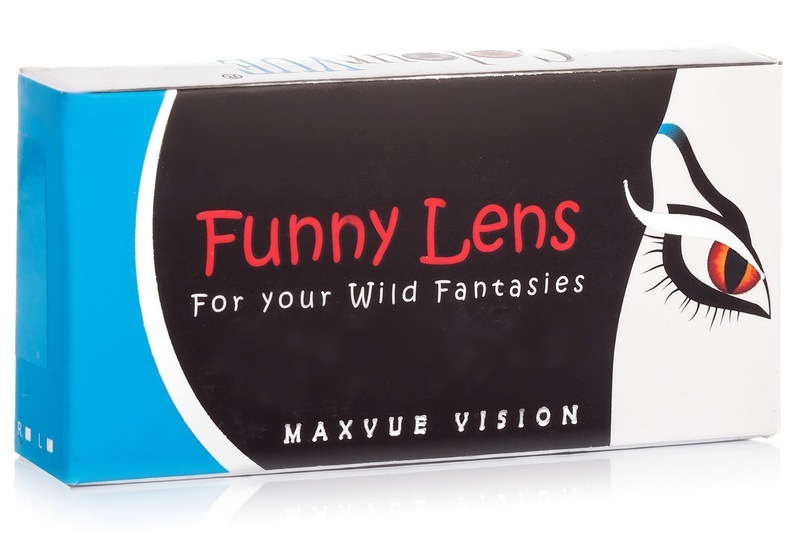 Great lenses, very comfortable and available in my prescription. Excellent servic. The coloured contacts were perfect and the most comfortable I have worn. Perfect product which allowed me to wear coloured contacts with a prescription, they stood out and were commented on all night, thanks. Contacts were exactly what I needed for Halloween, will definitely be recommending it to my friends for the future. Very confortable and lenses look exactly like the picture. As a user of monthly contacts I found these to be of exceptional quality, no issues whatsoever . 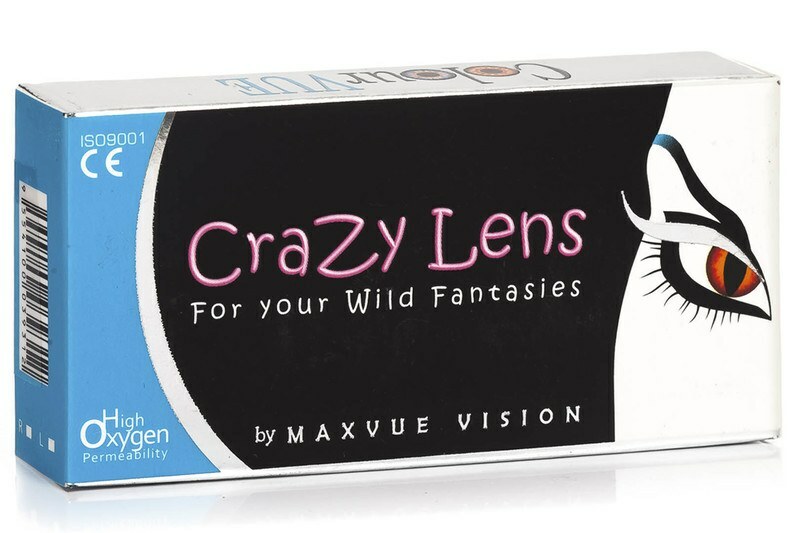 I ordered crazy lenses for Halloween. I am very pleased with the product and its a bonus that the lenses come with prescription. You simply pop the lenses straight in, fantastic for Halloween costume. I'd recommend the product to anyone who wants to make a impression with their outfit. Good quality, does exactly what it should. Great lenses for Halloween. Swift arrival too. I use this product for daily use ( the lenses I ordered are on strength. They gave me after two days of use a eye infection. I have to order new lenses by another company now. Thanks for wasting my money. I wear mine to work on occasion I love them and recommend them to everyone if you want to freak people out. Really good product, particularly as I found it difficult to find prescription coloured lens. Product used for stage purposes. Was finding it difficult to get dioptric coloured lenses until I found this site, so thank you! excellent product and one of the few ones that have a higher prescription. Wuld be great if you could offer more colours for those of us who have bad eyesight. I use the lenses on and off when i feel like a change.nI would recommend it to anyone who would be interested. Lenses ordered for my daughter,to compliment an outfit she wore to Comicon. The best-coloured contact lenses for Halloween are the ColourVUE Crazy Lens. 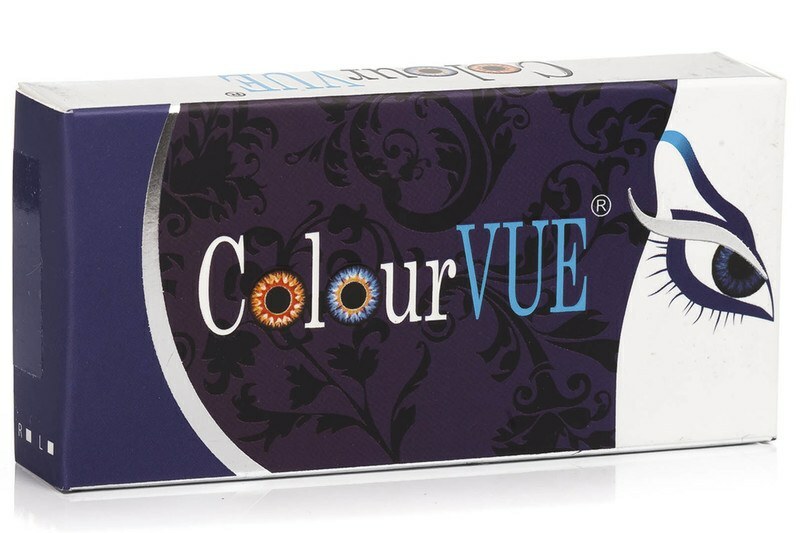 ColourVUE Crazy Lens have unique designs and colours that completely cover the natural eye colour. With unique technology that guarantees oxygen breathability and safety as the colourant is locked in the bottom layers of the lens, you can wear them for a really long time. This range of contacts also includes prescription white coloured contact lenses. ColourVUE Crazy Lens can be used daily but you have to replace them quarterly. I'm interested in the white zombie but in the picture, the eyes look the same? Do those contacts white your eyes out completely? These lenses are quite thick, compared to ordinary lenses, in fact they can't be worn for long periods of time. If you take a look at the “real photos” you'll see that White Zombie makes your eyes actually white. Yes you can, there is no difference in the lenses' shape, between left and right eye. Hello Germaine, Since we've just been through the Halloween madness it might be a while before they are re-stocked. However let's not despair, as there is a good chance they'll be back sooner than we think. Please contact me on info@lentiamo.co.uk, so I will tell you what the buying department will say to me on the subject. What type of solution is suitable for storage of these lenses? How long can these be stored after use, is there a lifespan of the lenses, if I wanted to use them a second time? Well, they last 3 months and can be worn as many times as you wish. Bear in mind that crazy lenses can be very uncomfortable and should not be worn for more than a few hours at the time. Are the Anaconda Lenses bottom-weighted to not rotate? After inquiring with my colleagues, I was told that they have some kind of way to stay vertical. I don't know if there's a weight, or not. Forgive me if I can't be more precise. Dear Graham. Thank you so much for your message. You can order the lenses with some powers from –1 to –6 but it will also depend in which colors you are interested in. If you have a different prescription for each eye you will need to order 2 boxes. Please do not hesitate to contact us again if you require any further information. Have a nice day. Hi, my prescription is different in each eye will I have to order two boxes? Dear Rebecca. Thank you so much for your message. Yes if you have a different prescription for each eye you will need to order 2 boxes. Please do not hesitate to contact us again if you require any further information. Have a nice day. Hi I just wanted to check that you can definitely receive these in prescription. Thanks! Dear Nicki. Thank you so much for your message. You can order the lenses with some different powers from –1 to –6 but it also depends in which colors you are interested in. Please do not hesitate to contact us again if you require any further information. Have a nice day. Hi if i ordered them now will I get them by Halloween ? It's a bit late, but if you order with UPS express delivery, you should get it by Tuesday. If I order them tonight will they be here for Halloween? If you order before 1,00 pm today (Royal Mail) you might receive them by the 31st. Do UPS deliver on Saturdays?? Sorry Macy, UPS would deliver on Monday an order placed on Friday. If I order it UPS now, will I receive tomorrow? If you place the order before 1,00 pm UPS will deliver by the end of the following day. I am afraid that in this case it is a bit late…sorry. They are quarterly, therefore they last three months. Of course, they have to be properly cared for by keeping them in the solution. Hello, If I order prescription lenses today, will the lenses be delivered by end of Friday/Saturday morning to SW London? They might, only if you're lucky. It would be advisable to request a UPS express delivery. No, at this point it would be advisable to go for UPS. Can you see through the Black out black lenses? How does it work? Clear in the middle with black surrounding? You can't expect to have a clear view with crazy lenses, but yes in the middle there's just about space for the pupil to see through. Just don't insert a power, if you don't need to. The BC and Diameter are fixed, so that should not be a problem. Bear in mind that these lenses cannot be worn for long periods of time, as they're not as comfortable as proper contacts. What solution can I use to clean them? Anything I definitely CANNOT use ? Also how exactly do I clean them? Some websites say I should rub, others sayjist soak. And do I need to replace the solution every day even if I don’t wear them every day? Also read the instructions on the solution's pac­kaging. Some solutions require you to rub the lenses, others don't. my eyes are 2 different prescriptions so would i have to but 2 separate boxes? Yes, in your case you would need 1 box per eye. Hi. I bought these but am unsure are they daily wear or 30 days? They are quarterly, therefore they can be used for 3 months. Make sure you take good care of them and follow whatever instructions are on the package. Do you only do - perscriptions? I'm +5.5 do you have anything suitable? Unfortunately crazy lenses are limited to those parameters, as they are really for cosmetic reasons, rather than for eye sight correction. Hi I’m -2.75 and -3.25 but you seem to only have -2.5 or -3. Should I round up or down? Or do you do them in my exact prescription. Hi Shelley, You really should ask such question to your eye doctor. Crazy lenses are mostly cosmetic and that is why there's a limit to the power you can have, unfortunately. You can put the lenses in straight after opening the blister. Can I confirm that the black out sclera lenses are available as a -6.00 prescription? I’ve been searching for these everywhere and I thought they didn’t come as a prescription. Yes, they go down to –6.00! Are these daily lenses or can you put them in solution and reuse them for a few weeks? They're quarterly lenses and should be replaced every 3 months. Please follow the manufacturer’s in­structions closely. ColorVue Crazy lenses are worn primarily for cosmetic reasons and their prescription is limited to short-sightedness. Are these suitable for astigmatism? You need Toric lenses for astigmatism, which unfortunately we do not stock, in this type. No, I'm afraid these lenses don't come with that power. As you can see from the drop-down menu, for these lenses, you can have –4.00 and –3.50, unfortunately not –3.75. Are the Halloween coloured lenses daily, monthly? Can I wear them more then once if stored correctly as I have a few halloween parties? These specific lenses are quarterly, but in the coloured lenses page on our website you can also find monthly and 6 months lenses. What a joke £17 a box no one who needs a prescription has two the eyes the same almost everyone has a weaker eye , so to charge twice £17 just for us to have one pair! Unfortunately we are unable to force the manufacturer to pack boxes for specific customers' prescriptions. I apologise if this causes any inconvenience with our customers. Hi Hannah, Unfortunately WhiteOut is nondioptric. As my eyes are 2 different prescriptions, would I need 2 separate boxes? Yes, you would definately need a box for each eye. Are the wildfire lenses going to become available/be restocked in -2.25 or -2.00? All I can say is that they are being re-stocked, but unfortunately I cannot tell you exactly when. How long can you wear these lens for? Are they one day lens or monthly-30 days. These are Quarterly disposable contact lenses and can be used for up to three months. Hi Carmen, Some colours are already available with that power. We are currently re-stocking all coloured lenses. After the Wildfire or anything similar, do you have it in R 3. 25 + L 3. 75+? Hi Estella, At the moment we are selling off what's left of the old stock. It is possible that these lenses could be re-stocked before Halloween. Please try and check in late September… Sorry if I can't be more helpful. Can I get the wildfire lenses with prescription - 2,50??? Hi. You don't appear to have my prescription. Can you help? Right eye: Power 7.00 BC 8.70 Left eye: Power 6.50 BC 8.70 Ideally looking for red eyes for a zombie fancy dress. Many thanks if you can help. Jen W.
Thank you for your comment. Unfortunately, these contacts are produced only in power –6.00 the maximum. How long do these lenses last? I have been looking for ages and I cannot find if they’re 1 day / 1 month etc, they’re the same price as most 1 month ones but I can’t find where it would say?? Hi, Unfortunately I have two different eye strengths. -2.00 in one eye, and -4.75 in the other. I only need a pair of lenses, is there any way I can get two different strengths in one box? Can these be worn multiple times? I ordered 2 lenses but only recieved 1 lense? Hi. I have very dark brown eyes, nearly black. Will the red lenses still show through as red as the pictures on your website even with my eyes being so dark? how long is delivery i need zombie white for saturday? are these daily disposables or monthly? Hey, what is the expiration date for these contacts? Can I wear these on more than one occasion? If so how do I store them? Hi, my prescription for my eyes is -2.75 on each but the only option I have on here is 2.5 or 3.00. Is there a way I could get 2.75? Hi, I am sorry but these are not toric lenses so there are no axis and cylinder with these lenses. You can find coloured toric lenses here: https://www.lentiamo.co.uk/…toric-1.html Thank you! Hi, one of my eye is a different strength from the other can I have both my prescription with the 2 in a box? Hi, I am sorry, but you will have to order two different boxes if you have different strengths in each eye. It isn't possible to put the two into the same box. Thank you! Hi. My normal, prescription is for 14.2 diameter and I want to purchase a pair of red prescription lenses for a one-off event i.e. Halloween - but I see that you only sell the lenses with a diameter of 14.0. Will this matter as it's just for one evening? Hi, It is honestly up to your doctor if it is okay or not for your eyes. You can definitely take the risk if you feel up to it, I just don't want you to waste your money if it doesn't feel right. Thank you! Do you have coloured lenses for an astigmatism? Good morning Jason, Yes! We do. You can find them here: https://www.lentiamo.co.uk/…toric-1.html Thank you! do they come with any solution and trays? Hi, They do not come with solution or cases. You can add one using your bonus points, or see if we have anything on offer! Thank you! Is it possible to get a different prescription for each eye? Can you do different powers for each eye? How long do the lenses last? Is it 30 days from when you open them? Hi, These are actually quartly lenses so they will last you up to 90 days after opening! Thank you! Hi, For these lenses, they do not supply + powers. You can order the lens with no power 0.00. Thank you! Does a cleaning solution and storage case need to be purchased separately for these lenses? If so, which is recommended? Hi, Yes, a solution and case will be needed when buying these lenses. I would reccomend the ReNu multiplus or the OPTI- Free Replenish. Thank you! Hi.....left is -2.75 And right is -1.5...can you help ? Thank you for your question. You can purchase one box with 2 lenses inside which are always the same parameters. We do not sell separately lenses with different parameters. If you have any further questions, feel free to contact me. Do you stock the Barbie Pink lenses with a prescription? Or are they just out of stock? Hi, These lenses are only available without a prescription. Thanks! Hi, are these lenses safe to wear while driving? We only dispatch Mo-Fr, before 1 PM and the delivery can take either 1 working day or 3 working days, depending on the service chosen. I believe it was not possible to provide you with the product in a timely manner. Still, I will be happy to remain at your service for any other queries. Thank you for writing to me. I am afraid that there are no Halloween lenses with astigmatism parameters. So, you will have to check with your optician, to see if he or she recommends you to make a compromise. However, that is not my decision to take. Please check what your optician would say and I will be happy to assist you with your desired lenses. Can you buy these as a one off purchase or does it have to be a subscription? Thank you for your question. Certainly, you can have an one off purchase. We do not sell on subscription. ​I hope my reply helped. Do i just order one box for a pair? Thank you for this question. Yes, just one box for a pair. Both lenses in the box have the same parameters. It is sufficient to enter the details for one eye only, if you have the same prescription for both. ​I hope my reply helped. Thank you for your interest. Currently we offer them at 15% off. So, it is a good occasion to bulk buy them. I am afraid that they only come in sets of 2 lenses per box. I bought the Cat eyes and the Yellow lenses. So far wore the yellow and the effect was AMAZING. I'm a cosplayer so lenses are very important to pull a costume together and these lenses did the job PERFECTLY. Shipping was super fast (I live in Malta and got them within 5 days) plus customer care is brilliant, helpful with extremely quick response time! I have some photos with the lenses on my page for anyone who would like to see; https://www.facebook.com/Kuroya-Cosplay-397155117129261/ Will definitely shop again! Hi. Thank you very much for this generous feedback. :) We will always be happy to be at your service! Does shipping date mean when they will arrive or when they are sent? Also what solution do you need to store them in to keep them for 3 months? You can and you should only store them in solution for a maximum of 3 month from the day you open them as stated in the Parameters of the lenses. You should not keep the lenses after the 3 months have past cause you will probably infect your eyes. Thank you for writing us regarding the tracking of your order. As this is not the correct place for dealing with an order please send us an e-mail at info@lentiamo.co.uk or via the contact form if you have further questions in the future. I have replied to you via e-mail regarding your order. If it says 3-6 shipping days And then I select the 2nd classed How many days does it take to come If I order today would I have it by the 31st? I just ordered these, during the entire process the delivery was always 3-6 days. As soon as I confirmed my order, they show up as out of stock, . No good if they arrive after Halloween. Thinking I had mossed the out of stock notice I logged out and re-ordered. Still no notice that these are out of stock. If they will not arrive before 31st, please cancel my order entirely. not good that your site allows you to oder items that you don't have. Hi, I am trying to get red contact lenses for me and my friend. I need diotropic but she doesn't, do you have the red contact lenses in non-diotropic as well? The link below may provide you with some red-coloured choices. https://www.lentiamo.co.uk/…ioptric.html I hope my reply helped. Hiya I've never ordered from this site before but reading your reviews i would like to. However the power for my contacts are -3.25 in both eyes. What would you recommend i buy as this option is not available. Hi. Do you sell toric lenses? Also my diameter is 13.80, do you tailor make lenses? The colored lenses come only in (-) dioptrics or without dioptrics and not for astigmatism. If you have more queries, get in touch with us. Hi, can you only wear these once or are they reusable? These can be used daily but need to be replaced once every three months. After their daily use, you need to store them overnight in a case with solution. Theses lenses are with prescription only. But you can find alternatives close to these ones. Is it £13.50 per one lens or for the pair? Hello. I am returning customer and always order lenses from Lentiamo. I really want to order crazy colour contacts however they come with 8.60 curve while mine is 8.40. Can you please advise if they will be in 8.40 or if it is a big issue to wear 8.60? Thank you! Thank you so much for your comment. The base curve (BC) is the curvature of the lens and it might coincide with your eye´s. However, it is possible to choose different ones which are close to yours. I have talked to clients who do not feel the difference, but we recommend you to ask first to your optician, you can just call him and ask by phone. I am confused about how to order these... I have the same prescription in each eye - do I still need to order a left and a right lens or will I get 2 lenses of the same prescription in one box?! Thank you so much for your comment. If you have the same prescription for both eyes, you can just buy one box of two lenses. You just need to add, for example, the information for the right eye and leave the left eye empty as this is for people who have different dioptrics in each eye. There is no difference in the shape of the lens, it is just for the dioptrics that we have a space for the right and left eye. Hi, are you able to use these lenses more than once? It says they are dailies but can you use the solution overnight then re-use the next day? Hi. Thank you for this question. They can be used daily but need to be replaced once every three months. Yes, you can store them overnight in a case with solution. How many do you get in 1 x box? Hi, There are two lenses in one box. Hi, yes there are still 2 lenses per box. Purchased the cateye contacts for halloween, Great price for prescription lenses, loved them! Would highly recommend! I have two pair of these lenses. I have the space blue and the zebra ones. Comfortable to wear, good price lots of fun, really would like the sky blue ones. Purchased Solar Blue. WOW bright. Excellent service and help as I needed the lenses quickly. Great to get Strange lenses in prescription strength.